We are a family owned & operated business with over a decade of industry experience. 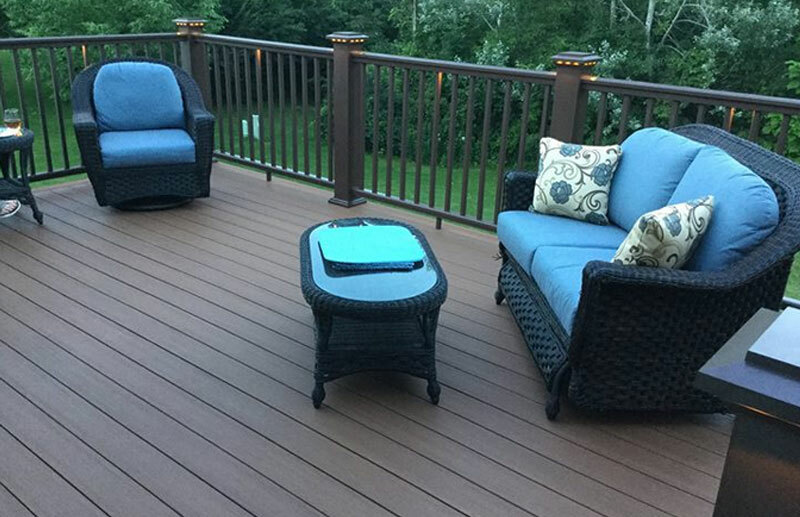 We pride ourselves on building your deck with high quality products and craftsmanship. Our estimates include everything needed to get the job done; we don’t want you to have any surprises on the final invoice. We handle the permit process, we can meet with your Homeowners Association to provide them drawings or material samples to approve your project, schedule all inspections and work extremely hard to communicate with our customer’s every step of the process. We appreciate that our work area, is still your home. During the build, you can expect our skilled craftsman to sweep up debris from the work areas and stack any unused building materials out of the way before leaving the jobsite each day. All of the products we use are brands we trust to ensure your new deck is solid from the foundation, to the finishing touches. Additionally, we stand behind every deck we build with a workmanship warranty. Building a deck isn’t something you do every day. We want to make your experience with us as hassle free as possible. If you find a part of your deck that isn’t holding up the way it should, we’ll work with our suppliers through the warranty process so you don’t have to. 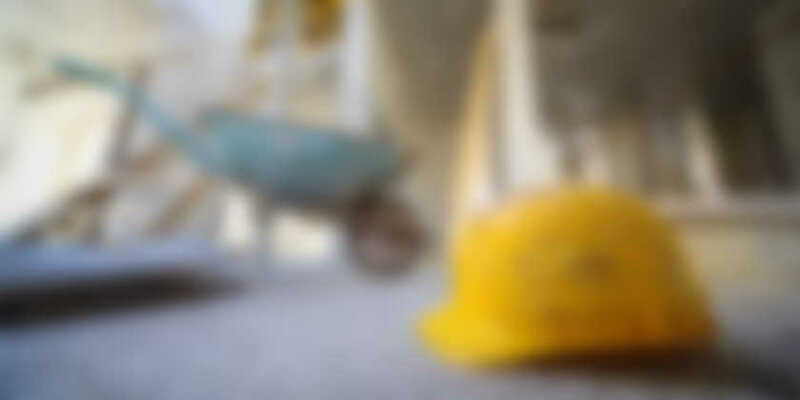 We’re one call away even after your project is complete. At Kirch Improvements, customer satisfaction is our #1 priority. When you call to schedule your free estimate, we ask that you allow approximately 30 minutes for the appointment. We want to ensure there is enough time to discuss all the options that are available to customize your new outdoor living space. Deciding how much you want to spend is an important step when building a new deck. While it is helpful to know your budget during the design process, we understand it may not be something you want to share. If we are aware of a budget, it allows us to better suggest materials, sizes, and appropriate accessories to best achieve your project goal. In many cases, we are able to provide a 3D rendering of what your new deck will look like. Details matter when it comes to your deck. That’s why our decks are built with longevity in mind. All the products we use on your deck are specifically designed for outdoor exposure and climates. For composite and PVC decks, we build our framing 12” on center. This provides a sturdy surface, and helps the deck last longer. All of our decks are built standard, with a single picture frame border. While this also is ascetically pleasing by covering the cut ends of the decking, it has a much more important purpose. A picture frame border will cover the gap between the fascia & framing, acting like a drip edge to help prevent rot and debris from building up. 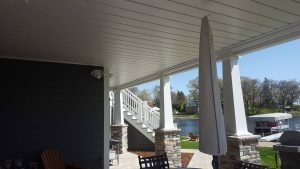 Hidden fasteners are also standard on our composite & PVC deck quotes. Every project is custom tailored to the house and the needs/wants of each homeowner we work with. Our aim is to continuously exceed the expectations of our clients. 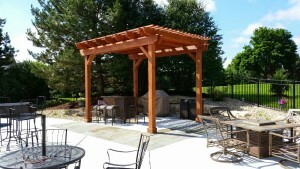 Our team of skilled craftsman is dedicated to building you a beautiful, long lasting outdoor living space. 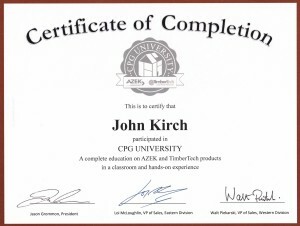 We've completed hands on training at Azek & TimberTech's CPG University and annually attend classes to keep up with current deck codes.